Do you have the right type of recycle bins and containers to make it easy for to live an environmentally responsible lifestyle at home and at work? While most people recognize that recycling is important, not everyone takes the time to do it. In many cases, this is simply because the places where they live and work are not set up in a manner that makes it convenient to dispose of items that can be recycled in an appropriate manner. If it isn't easy for people to stow unwanted items in containers designated for recycling, they'll often simply throw them in the garbage - even though they know better. Most of the time, people are simply going to go with the trash disposal option that is the easiest and most expedient solution at the time rather than searching for the best long term solution. That's why convenience is such an important consideration when it comes to making decisions about where to place containers for recycling and what types are necessary. 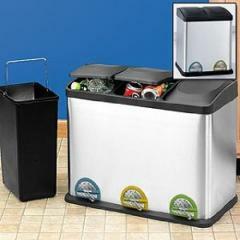 It's not difficult to place recycle bins and containers in strategic locations throughout your living and/or working space. You simply need to think about what types of waste are likely to be generated and locate appropriate containers for recycling in the areas where people are most likely to need them. By spending a little money now to purchase recycle bins and containers, you can make great strides in reducing the carbon footprint of your lifestyle, as well as the environmental impact of those who live and work with you. This is the best first step to take if you want the people you live and work with to develop the habit of recycling rather than throwing away items that are recyclable. 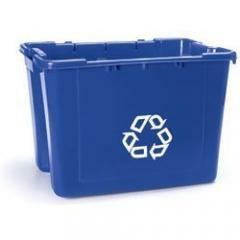 There are many types of containers designed to gather items for recycling. Before making a decision about the best bin options for your home or office, find out what types of recycling are available in your local area and learn the guidelines for how items need to be sorted prior to being picked up or dropped off at your local recycling center. It's also important to factor information about the volume and kinds of waste generated in your home and office before selecting bins and making decision about quantity and placement. This information will help you determine how many containers you need and what instructions need to be provided about placing items in them. 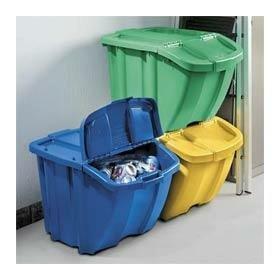 Color Coded - Select bins that are color coded so that it will be easy for people to remember what types of waste go in each container. Initially, you are likely to need to label the containers to make it easy for people to learn what types of waste go in each container, but with time - if you are consistent - it'll become easy for people to associate particular items with certain colors. Size - Choose containers that are large enough to be able to go for several days without being emptied, yet that are not too large to be easily carried to the curbside for pickup or placed in a vehicle to be transported to your local recycling center. Stackable - If you'll be placing several bins in a single room - such as containers for plastic bottles and aluminum cans in the kitchen - it's probably best to go with stackable bins. This will allow you to make the most of the valuable floor or cabinet space in the room. Remember that many people aren't likely to take the time to recycle if it is not convenient for them to do so. No matter what types of containers you have, they will only be effective if people use them. Containers dedicated to gathering paper for recycling should be placed in or near areas where paper waste is generated, such as by copy machines, printers, desks where bills are paid, and other appropriate places. Safety is also an important consideration when starting a business or household recycling initiative. When you are purchasing containers to hold paper for recycling, for example, it's also advisable to invest in a paper shredder. Use the shredder to destroy any documents that could provide ammunition for identity thieves prior to placing them in the bin. Additionally, if you are recycling containers that held food or beverage products, be sure to rinse them thoroughly before setting them aside for recycling. This will help ensure that your efforts to be environmentally responsible don't result in a pest infestation in your home.